Does every tree, plant and blade of grass have a spirit? This story begins years ago. I’ve always been a gardener and, in the early days of Twitter, there was quite an active gardening community there. Over time, I met and became friends with a few other local gardeners my age and we would lament that there were no garden clubs for people who weren’t retired. All of the club meetings were on weekday mornings when we worked. Let’s be honest. We could have started our own club, but I guess that never occurred to us. A few years later, one of us came across an event posting online for a group called the Garden Goddesses. A group of women in a nearby community who gathered to talk gardening once a month in the evening, with potluck food and wine. This sounded like our kind of group! Three of us signed up to attend and never really paid attention to the subject matter or the speaker for that month. On the day of the meeting one of our friends wasn’t able to attend so it was just me and my friend Carri who gathered our potluck contribution and headed up the hill to the meeting. We arrived to a beautiful home in the woods with a view and everyone was very friendly and welcoming. After some chit chat, they asked everyone to gather outside in a circle and hold hands. A gentleman (our speaker for the evening) led us in a short meditation and a cleansing and blessing of the land we were on. At this point in my life, meditation wasn’t especially new for me, but what did it have to do with gardening exactly? After the blessing, we moved inside for the presentation. The speaker, horticulturalist Jeff Dawson, started the presentation with this challenge: what he was about to tell us could seem a bit unreal. But what if it was true? He asked us to spend the evening just believing that what he was saying might be true. What might be true? And what had we gotten ourselves into? I don’t recall all of the details of his talk, but for the next hour, Jeff suggested that gardening is an act of co-creating with nature. That there were spirits that lived in each tree, plant, or blade of grass. And that if we really wanted to create special places, we needed to ask every day if the garden was willing to co-create with us. This was the most ridiculous thing we had ever heard. Other ladies at the meeting asked about crystal grids to protect their properties. This seemed even more outlandish. The meeting ended and as we drove back down the winding road, incredulous at what we had just heard, a fox darted out in front of my car and we had to stop to let it pass. What a perfect end to a wild evening. A fox?! That’s not something I had ever seen in that neck of the woods. There was certainly a message there, but I wasn’t quite sure what had just happened. We returned back to our “normal” lives and decided perhaps that wasn’t the club for us either. I didn’t think much about Jeff or nature spirits or crystals again for a few more years. Fast forward to the calling I received to move closer to “Pine Trees and Water” and our subsequent move to Montana. I was concerned about our house selling quickly and asked an intuitive friend if she had any suggestions. Sure, she said. You need a crystal grid. Yes, that’s right, a crystal grid. I suddenly remembered how preposturous that seemed on a couple of years before. But, with the promise of a quick sale, I was suddenly burying citrine in my front and back yard and laughing about it with my friend who had been at the garden club meeting with me two years earlier. Well, the house did sell quickly and over the next few years, as I noticed that the trees were talking to me, I started seeking out more information about nature spirits. Two more years passed and nature communication became a much more normal part of my every day life. In fact, if you’re interested in how I do it, you can sign up for my email list and you’ll get access to my Five Simple Steps for Communicating With Nature. Suddenly, the beautiful house in the Montana woods we had been renting was sold and we had thirty days to find a new place. This was the end of December and the first half of January and finding a new rental that time of year in Montana is challenging to say the least! I decided to stay calm and ask my guides to find us a new place. I wasn’t going to worry about it – they would steer us in the right direction. We ended up with an old, quirky (and slightly haunted) house on a large lot in town. Not exactly our dream home, but would certainly suit us until we could find something to buy. I knew we were led there for a reason, but what was it? As spring began, I attended a local gardening workshop and listened to someone talk about the spirits of the land. (I’m starting to think this is how my guides get my attention! Haha). She explained that each piece of property has one tree that is kind of “in charge” of everything happening on the property. I immediately knew what tree that was at our new place. She also explained that the earth spirits would share their wisdom with us if we asked. Huh. This sounds a lot like what I heard at that garden meeting so many years before. 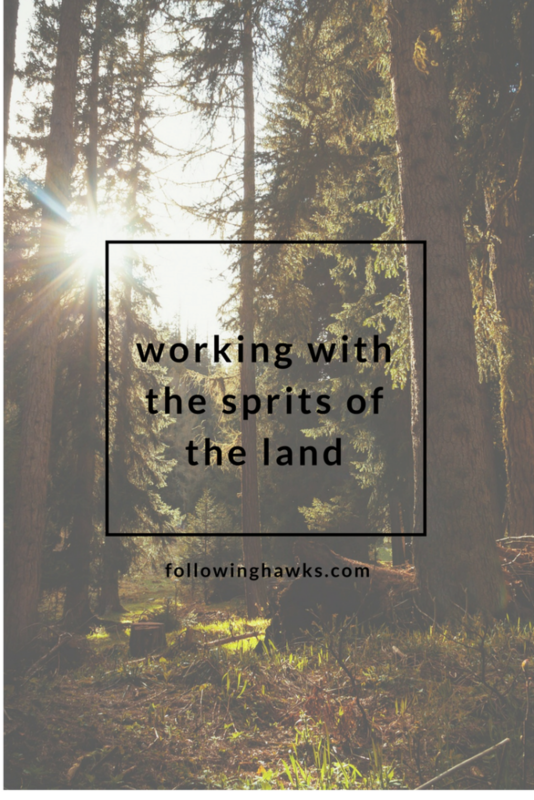 I hung around after the workshop to ask her a few questions and tell her about my guides picking the place we were now living and she suggested that I ask the spirits of the land why I was there. Every place has a spirit. The city you live in, the mountains that you see every day, the river flowing past, the piece of property you live on, and that big grandmother tree in the back yard (a spruce tree in my case). Over time, people have forgotten about consulting these spirits for guidance or advice and have excluded them from important decisions that affect them. The nature spirits take their job very seriously and if you cut down their tree without warning them or scrape the land to build a new subdivision, they will likely be very confused and possibly trying to continue their work to protect the area even though there is now an apartment building where a meadow once was. This can sometimes cause problems for the humans living or working in these disturbed areas. I decided to do a journey to the city of the town I was now living in to find out what it had to say. This town is currently in transition. For most of its history, it has been a blue-collar industrial town, depending on a lumber mill and an aluminum plant to employ its residents. Over the last decade, the aluminum plant closed after it became clear that it had been polluting the air and the water in the area (it is now a Superfund site and a multi-year cleanup has begun) and last year, the mill closed all but one small section, citing a shortage of logs. So what is next for this town? And why was I called here? I did a shamanic journey to the town and my guide Red Eagle brought me to the same plateau overlooking a river that he always did. And suddenly, I understood where this was. It was the town I was now living in, before it was settled. How had I not noticed this before?! The spirit of the land told me that for many decades it had been exploited for its natural resources and it was now time that they were appreciated. People here want to know what it will BE next, but the spirit of the town wants what already IS to be what the town is known for. The trees and the plants and the water want to be known as members of the community. At the time, I wasn’t sure what that all had to do with me and what I needed to do about it. In retrospect however, this is the town where I have learned to do the grid work and was asked to do quite a bit of reconnecting grids between the mountains and the valley here. I believe this action is improving the energy in our community, allowing it to be seen in a new light and motivating the residents here to create something new. I see it happening every day with new businesses moving in and home prices on the upswing. People want to be a part of this town and make what it already IS even better. I’ve also realized in subsequent journeys in the past few months that this isn’t the first lifetime I’ve lived here. So I suppose it’s no surprise that I was called back. So why would you want to work with the spirits of the land? I’ve since come to be certain that what Jeff was saying at that garden club meeting all those years ago IS true. We have an opportunity to create the world around us with the assistance of the nature spirits. And they have the opportunity to create what they want with our assistance as well. It truly is co-creation. So take the time to journey to the spirit of the land you live on (or your community) and ask what it needs. Remember to ask for permission before making changes to the landscape in any way. Say thank you for everything you receive: the food, water, air and energetic resources shared with you daily. Be prepared to apologize for the arrogance and ignorance of those who have been on the land before us. There may be some pain that needs to be healed before a particular area can flourish once again. As always, I’d love to hear about your experiences. Just discovered you through Pinterest. I’m so glad to have found you. You confirm what I’ve been feeling for a few years. Still finding my way as well. Thank you for sharing. Thank you so much Aimee! I’m so glad you’ve been able to connect with the spirits of the land all around you. It really does make our environment so much more alive when we’re all working together.